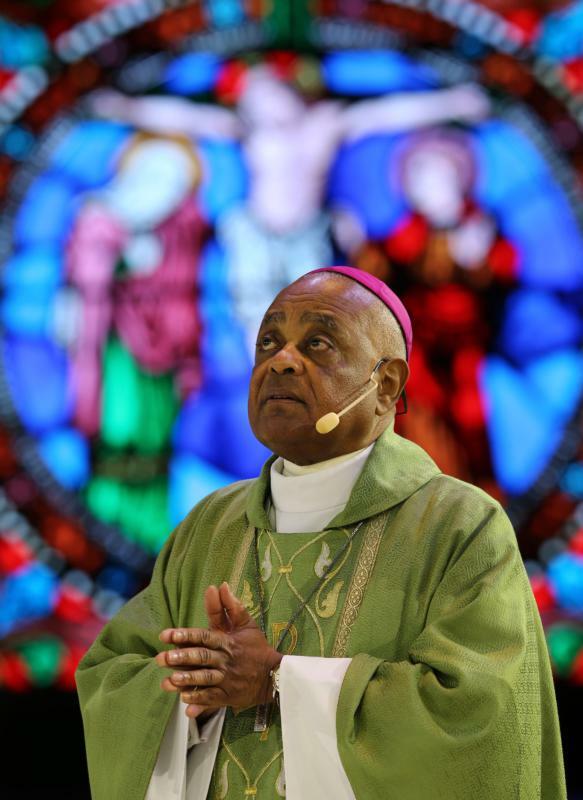 Atlanta Archbishop Wilton D. Gregory issued a print and video statement Aug. 9 expressing his "profound anger, sadness and distress concerning sexual abuse by church leaders of children, young people and those over whom they exercised authority." Archbishop Gregory is pictured during the 2017 Catholic convocation in Orlando, Fla.
ATLANTA (CNS) — Atlanta Archbishop Wilton D. Gregory issued a print and video statement Aug. 9 on the website of The Georgia Bulletin, archdiocesan newspaper, expressing his "profound anger, sadness and distress concerning sexual abuse by church leaders of children, young people and those over whom they exercised authority." "My anger and disappointment, shared by Catholics and others, are only heightened by the reality that leaders who have engaged in or neglected to protect others from such damaging and deviant behavior have for many years failed to be held accountable—and have even risen in leadership positions," he said. "We must do better—for the sake of all victims and survivors of sexual abuse and for the sake of everyone whom we serve." Archbishop Gregory said Catholics everywhere, including him, "are stunned and justifiably angry at shameful, unrelenting recent revelations of bishops accused of abuse or mishandling allegations of abuse—behavior that offends and scandalizes the people of God entrusted to our care." He said Catholics are specifically "enraged" about allegations of abuse by Archbishop Theodore E. McCarrick and find "any pastoral negligence in protecting our people is similarly grievous." "We are weary of this cloud of shame that continues to shroud church leadership and compromise our mission," he said, adding that he is "personally disheartened" because in 2002, as president of the U.S. Conference of Catholic Bishops, he made assurances that this crisis was over and would not be repeated. "I sincerely believed that the unprecedented steps we took at that time would help to heal this wound in the body of Christ. And so they have, " he added, "though obviously not completely or even sufficiently." The archbishop said he was saddened because many good priests are again "seen as suspect not because they have done anything wrong" and he was hurt that his respect and fraternal esteem for Archbishop McCarrick "were clearly misplaced." He said he never personally worked with Archbishop McCarrick in any pastoral context and said he also "never knew or suspected the hidden side of a man whose admired public persona concealed that of a violator of foundational Christian morality and of young people who trusted him." "Like any individual who discovers far too late that a friend has a history of moral misconduct, I now stand dumbfounded that I was so unaware and naive," he said, adding that he knows many other bishops feel the same way. "People are angry, as well they should be, that our church is once again viewed as a haven for criminal deviant behavior," he said, adding that priests also are hurt and Catholics are disappointed with bishops in general "who seemingly cannot or will not act decisively to heal this festering wound." "Given the current situation, oversight by laity may well provide the only credible assurance that real and decisive actions are being taken." Catholics are "perplexed and sickened," he said, "that the Holy See may well have dismissed multiple warning signs" that should have stopped Archbishop McCarrick and others earlier in their careers. He also said Catholics are disheartened that situations here and in other countries continue to "call into question everything the church has done to safeguard children and adults from manipulation and violation." Archbishop Gregory said he recently met with archdiocesan seminarians and told them directly "that if any person in any context made advances or exhibited behavior that made them feel uncomfortable or threatened, they are to notify the director of vocations, one of the auxiliary bishops or me personally so that we may take swift and appropriate action -- pastoral and legal. "Their parents and family members should know that these young men are in safe and respectful environments and that, as their archbishop, I will not tolerate any activity that threatens to harm or intimidate them." He said that while the USCCB's current leadership considers its next steps, he strongly urges these leaders to "engage the laity in reviewing and recommending courses of action that will assure the faithful that we are serious in curing this blight from our church and from episcopal governance once and for all." He pointed out that when the USCCB established a national lay review board in 2002, there was some pushback because some people felt they were "improperly ceding control of the ministry of bishops" but given the current situation, he said, oversight by laity "may well provide the only credible assurance that real and decisive actions are being taken." "Our trustworthiness as bishops has been so seriously compromised that acting alone -- even with the best of intentions and the highest principles, policies and plans --may not move the hearts of the faithful to believe," he added. "Like so many of you I am angry, but I am not overcome by despair. I hope and I pray that the Holy Spirit will cleanse and strengthen the church," Archbishop Gregory said. "My anger has not led me to hopelessness; I pray yours has not either. I am grateful for your witness of faith and hope, even in difficult times." hey Gregory--if you are weary, just think how the vctims feel! You are such an institutional man, constantly worried about the effect on the establishment (i.e. Church), and so impatient to get back to the 'good work' of the institution. Such a lack of imagination, that you can't think outside the box, and imagine a whole different way for laity to relate to God that does not involve you and your corrupt institution. Arthur, we often agree, in this instance though, I think you are being too harsh on “Gregory.” I am a victim of (adult) clerical sexual misconduct, and I want to tell you how I feel. I am elated that these issues about the power dynamics at seminaries and in ministry are finally breaking through the darkness. I do appreciate that Archbishop Gregory has named, not only the disgust with McCarrick’s behavior, he is also articulating appropriate blame on the leaders, including the Holy See, who promoted and protected him, diluted that sweeping harassment allegation under the rug would not be morally reprehensible. On the other hand, his claim of naiveté is hard to swallow. I was also naive. but after only a few years at a Jesuit theologate, I do not have that problem anymore. It's a great time to be a Catholic in St. Oliver's parish in the Archdiocese of Atlanta. Father Cyriac, Archbishop Gregory, and Pope Francis are all true blessings from God. This story shows why - Archbishop Gregory is a man of God who truly gets it. Archbishop Gregory - I pray that Jesus' church leaders reach out a hand of brotherhood to the lay and religious Catholics who love the church as you do. Welcome us in as partners to all church function, oversight, and leadership. We want to fully participate in Christ's call to evangelize the amazing news of abundant life He won for us. We are angry and heart-broken, but the message of revolutionary and sanctifying love of Christ can't wait. The world needs it! Please - let us help!